How pure do you want it? You can make you own E85 fuel! If you want to use your home-made ethanol in your car as E-85 (85% ethanol and 15% gasoline, before you mix it with gasoline, it has to be 100% pure: 200 proof. This will be a high octane fuel: about 102 octane. You may get about 10% less mileage as there is technically less energy in alcohol than gasoline. If you increased your compression and do everything to optimize your engine for alcohol, it will actually get better mileage and/or more power, as a higher octane (slower burning) fuel is more efficient. But even though the Charles 803 still will make 194 proof, first time, every time, you can never remove that last 3% of water using a still of any kind. You will need to use a molecular sieve. This sounds technical, but it is real easy. Just read this letter I got from Dr. Grant Carlson with Eco-Rebuilders. "Since we remanufacture old third generation Corvettes with big horsepower-high compression-fuel injected engines, homemade E85 is important to our customers. A molecular sieve is just zeolite: link to information about the manufacturer we use is shown here. Buy Type 3A in 10lb bags (looks like a small pea gravel) it is only a couple of bucks and it works very well to dehydrate the ethanol. We mix about 5lbs in a 5 gallon can and let it sit with the ethanol overnight and pour the dehydrated ethanol through a screen, into another can the next day. To get the water out of the zeolite we just broil it on the backyard grill - it is reusable indefinitely. Excerpt from Roger Lippman's book on converting VW engines, c. 1980. This outlines an approach to engine modification generally applicable to four-stroke carbureted gasoline engines. (Not covered are fuel-injected, two-stroke, or diesel engines.) While it cannot give specific calibrations, due to the wide variety of engine configurations, it offers a sense of the scope of the task and provides a place to start. It is understandable that people may want to use an older engine for this experiment. There is the risk, however, of problems due solely to worn-out parts developing after the car is converted. It is important to be able to distinguish these from problems that may be due to the ethanol or to an error in modification. So it is recommended that the engine selected for modification be in the best condition possible. The first question to consider in approaching engine conversion is whether there are any materials in the fuel system or related systems that will be damaged by ethanol. It would be most unfortunate to pour ethanol in your tank and have parts of the carburetor dissolve. Metals commonly used in fuel systems are usually ethanol-compatible. Magnesium is known to suffer severe corrosion when in contact with ethanol. Fortunately, it is rarely found in fuel systems. Among non-metals, cork does not fare well with ethanol. Polyurethane and fiberglass-reinforced polyester have also been known to deteriorate in ethanol. Avoid plastic fuel filters - the glass ones are preferable. Aside from these items, non-metal problems with ethanol are unlikely. Take your fuel pump and carburetor apart and clean them; soak them for a month in 180-190 proof ethanol. (If you can't afford to have your car apart that long, pick up used parts from an auto wrecker.) Likewise, soak a fuel filter and a piece of fuel hose. Agitate the container from time to time. When the time is up, look for pitting or corrosion of metals. Check non-metals for softening, hardening, cracking, or change of size, shape, or weight. If preliminary tests indicate materials problems, consult your local auto parts store, carburetor specialty shop, racing supplier, or machinist regarding suitable replacements. It is also important to watch parts peripherally related to the fuel system that may be exposed to ethanol vapors, such as vacuum advance diaphragms, automatic transmission modulators, and power brake assist units. Problems here are unlikely but worth watching for. Because ethanol is a dirt loosener, it will free dirt that has accumulated throughout the fuel system. For this reason it is important to install a fuel filter before the pump, and another between the pump and the carburetor. Use the cleanable type, and check it often in the first weeks of ethanol use. Finally, note that ethanol spilled on the vehicle paint finish may have adverse effects. Paint softening and wrinkling have been experienced in some cases. The carburetor meters the flow of fuel to the cylinders and mixes the fuel with air. Because ethanol supplies less energy per unit of volume than does gasoline, fuel-metering jets must be enlarged to allow the proper amount of fuel to pass. There are many carburetor designs in use, and it is not possible here to give specific directions for all. It will be necessary for you to experiment in the context of the guidelines provided here. Start by calculating the factor by which your jets must be enlarged. The formulas in Appendix B indicate that jet diameters for gasoline should be multiplied by 1.27 for pure ethanol (200 proof). Most people, though, will be using 180-190 proof. Unfortunately, the formulas do not seem to give accurate answers for hydrous ethanol. Start out about five per cent larger than the figure you calculate. Obtain a carburetor rebuild kit, which will include a detailed diagram of your unit. Clean and overhaul the carburetor since you will have it apart anyway. Identify all fuel metering jets, including: main jet, pilot (idle) jet, and accelerator pump nozzle. Most jets are stamped with the orifice diameter in metric or English units. On a metric carburetor, a number such as 120 means 1.2 mm. ; on most U.S. units, 50 indicates .050 inch. There are exceptions; check with a carburetor shop to be sure. Convert millimeters to inches by dividing by 25.4. Multiply your jet sizes by the conversion factor. Obtain new jets of the proper size, if available, from a parts or racing equipment supplier. Often they will not be available, and you will have to drill out the old jets yourself. Determine the proper drill bit sizes from the chart in Appendix C. Obtain the bits and a pin vise from a tool supplier. Do not use an electric drill. Carefully enlarge the jet, wash it, and blow it clean with compressed air. Some carburetors incorporate a staging adjustment for the accelerator pump. This controls the duration and quantity of fuel injection from the pump. In addition to enlarging the nozzle, lengthening the pump stroke may help. Because ethanol is 7 to 8 per cent heavier than gasoline, it may be necessary to adjust the float setting to maintain the proper level of fuel in the float bowl. Otherwise the fuel level will be too low. Bend the float up slightly or use a thinner gasket under the needle seat. As an alternative, find a slightly heavier float. On cars with automatic chokes, adjust the choke unit to a winter setting. When the engine is running again, adjust the idle and mixture screws. Carburetor modifications, especially jet sizing, will be a matter of some trial and error. With jets it is better to start small and work up. If you go too far, you can buy a new jet and try again. You can judge your results by comparing power and CO emissions with gasoline operation. Both should be similar. Power is also affected by other factors, as we shall see. Below 60-65 degrees F., ethanol will not vaporize sufficiently to form a combustible mixture. The simplest way to start a cold engine is to inject a more volatile fuel into the intake manifold or carburetor. Gasoline and propane are good candidates. Straight ether is not recommended, but there are ether formulations - used for starting diesels--in which the tendency of ether to explode all at once is modified. A gasoline cold-start system consists of the following components: Fuel tank. A one-gallon motorcycle tank will do. Install it in the trunk where it is well protected in case of accident and away from engine heat. Secure it well. Fuel line. A metal tube runs from the tank to the engine. Install it so nothing rubs against it. An in-line fuel filter should be installed near the tank. Pump. An electric or manually controlled pump should be installed in the line where convenient. You will need a switch or other control on the dashboard. Beware of pumps not designed for gasoline, such as windshield washer pumps. The plastic and rubber parts may degrade when used with gasoline. Nozzle. Connect the fuel line to a small nozzle with an opening about the size of the accelerator pump orifice in the carburetor. This nozzle can be installed in the air cleaner, pointing straight down the carburetor throat, or in the intake manifold. A propane system is constructed as follows: Fuel tank. Buy a propane-torch kit, which includes the tank and a pressure control valve. The orifice in the tube, after the valve, should be drilled out somewhat to allow an adequate flow of propane. Mount it away from the engine compartment. Control valve. Propane is stored at high pressure - over 200 psi - so a special electric valve is required to control it. This is available from a valve supply shop. It is recommended that the valve be brazed to the neck of the pressure control piece to insure against leaks. A switch on the dashboard, preferably with a warning light, is wired in to activate the valve. Fuel line. Tightly clamp a fuel hose to the electric valve and connect it directly to the intake manifold or carburetor in a convenient place. Note: With either the gasoline or propane system, inject fuel for just a few seconds, while starting the cold engine. It will run on ethanol alone almost immediately. Preheating engine coolant is an alternative approach. In engines that incorporate a water-heated manifold, a small electric water heater installed as close to the manifold as possible will improve cold starting. Such heaters are often used on gasoline engines in cold climates and are commercially available. Of course, you have to plug it into the wall and wait. Improved spark quality, as discussed below, also aids in cold starting. This is the link to Roger Lippman's book on converting your car to run on ethanol. 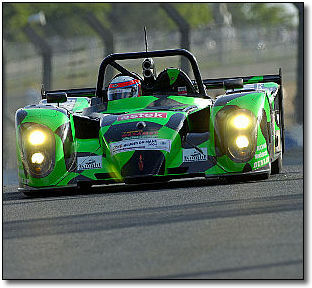 The description might sound like a bad joke, but the DM139 LMP1, Judd V10 is fast and black and "green" all over. So fast, in fact, that the Nasamax racing team placed 17th out of 26 cars to finish at this year's Le Mans 24 hour race with the DM139, which runs entirely on bio-ethanol fuel. It was the second year the team qualified for international motor sport race, but the first year the drivers took it to the line to become the first team to place with a car run on alternative fuels. "It's very interesting out there. There are people flying off all over the place, perhaps a few who are new to Le Mans," night driver Werner Lupberger said. The Kent, England based team has a core of experienced scientific and racing personnel who belong to an international racing program designed to promote low-emission renewable fuels. Motor sport racing is a big industry and a big fuel consumer, and not what many people think of as environmentally friendly. Development partners for the green fuel venture are Applied Sciences Technologies (ASTEK) and Cosworth Racing. ASTEK is a research and development company that specializes in renewable and sustainable technologies. They have developed technology for the use of alternative fuels in internal combustion engines, and methods for the production of bio-ethanol from cellulosic materials. Fuel for the DM139 engine is made from sugar beets and potatoes grown in Northern France. Cosworth Racing is a division of the Ford Motor Company, and they designed, developed and manufactured the XDE engine used by the Nasamax team. They are renowned for their Formula One engine development for teams such as Jaguar and Jordan as well as for the WRC Rally program. "This is the first time for years Cosworth Racing has been involved on a factory support basis in sports cars. It also marks the first time we have used renewable fuel, bio-ethanol, in a racing engine and it is very exciting to be spearheading this technology," said Nick Hayes, Managing Director for Engineering at Cosworth Racing. Cars that qualify for the LeMans have to meet race regulations, so the Nasamax team had to work on ways to meet the regulations while ensuring the DM139 could compete with the other cars in terms of tank capacity and fill rate during refueling. Bioethanol fuel contains only 75 percent of the energy of the same volume in gasoline, so the car needed 135 liters of tank capacity to carry more of their 200 proof fuel than a standard racecar. Information on the team's Web site used a comparison of coffee and espresso to explain why a greater volume of ethanol (coffee) is necessary to run the DM139 for the same amount of time as a car run with fossil fuels (espresso). An espresso carries a certain amount of caffeine in a small quantity of drink, while regular coffee will carry the same amount of caffeine but in a greater quantity of the drink. If caffeine intake were the goal, then a person would need to drink more coffee than espresso. If fuel combustion is the goal, then a driver needs more ethanol because the efficient fuel burns up faster than fossil fuels. Engine performance with ethanol was everything the team could have asked for, but regular racing setbacks kept the car from moving up any higher in the race ranks. 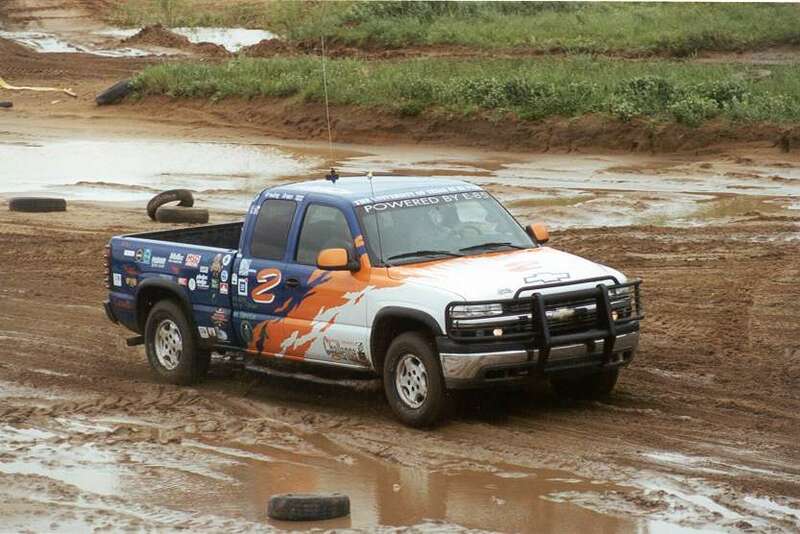 Regular tire changes, a starter replacement and a persistent misfire made the team lose laps. "We lost time trying to find the misfire and eventually we had to just get on with it," McNeil said. "It's frustrating as we know what lap time we could have had, and we know it would have put us safely in the top ten, even the top six. However, these were the usual setbacks any car could have in racing, and we have still shown that this fuel can be competitive in the top level of international motor sport. To do so with a new racing car to completely new regulations is also a major achievement for the whole team. We will be back next year." The three drivers completed a total of 316 laps around the 8-mile race circuit at Le Mans. McNeil estimated they lost about 41 laps to pit stops for the misfire. Le Mans takes place every year in the Sarthe region south west of Paris, and has always been a showcase for the debut of new technologies in the harshest competitive environment in motor sport. The 8-mile circuit is a mix of permanent track and roads. This car is designed to run on 85% ethanol. Click on photo to a list of E-85 ready cars. You may already be driving a Flexible Fuel vehicle (FFV) and not know it! Things have changed a lot for engines made in the last ten years: most cars now already have a computer chip that controls the fuel injection and timing. Many are already setup to use E-85 fuel (85% Ethanol and 15% gasoline) with no change to the engine whatsoever! The built-in O2 sensors measure the Oxygen content of the fuel (since there are a lot of fuel blend combinations, according to if it is summer or winter, or which state you live in). This means that you can make your own E-85 and go. When you need to re-fuel, just buy normal gasoline again, and the engine will automatically compensate. This is what a Flexible Fuel vehicle is all about. But check with your owners' manuel before you try this, or ask the mechanic at your dealership. FFV’s (Flexible Fuel Vehicles), factory ready to use E-85, are widely available. Approximately 2 million FFV’s have already been sold in the United States, even though many buyers are completely unaware that they use E85 fuel (85% Ethanol). This is according to the National Ethanol Vehicle Coalition. Check your owner's manual, visit with your dealer, or see this list of current model year FFVs to determine if you drive a vehicle that can fuel with E85. Here is a list of car models currently available as flexible fuel vehicles. This related link takes you to a site where you can search vehicles made in year 2000 or later to see if they are already considered an FFV vehicle. This is the link to click to order Zeolite (molecular sieve), which will enable you to turn your 180 or 190 proof homemade alcohol into 200 proof alcohol, suitable for making your own E-85 fuel. E-85 is 85% anhydrous (no water) alcohol and 15% gasoline (regular, unleaded). Read what Dr. Grant Carlson says about this on the left side of this page, right there at the top. This is a very good report on all the things necessary to convert a modern engine to be compatible with ethanol. this is a very long page, so scroll down near the bottom to see how they modified the fuel injection and delivery system for both safety and performance. Alcohol fuel has been around for a long time. 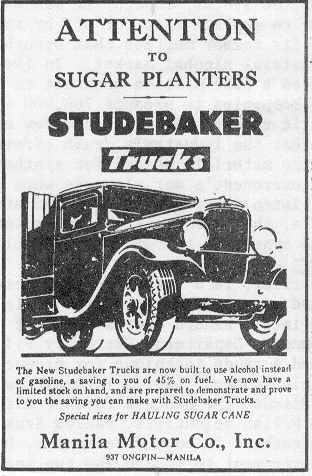 This is an actual ad for Studebaker Trucks! This above link is an out-of-print article published by Mother Earth News, on how to adapt your engine for alcohol. It also provides a list of materials compatible with ethanol. The petroleum industry has a lot of reasons why we shouldn't even think about using a different fuel, and actually put out a lot of mis-information. Check out this link below for more technical info on alcohol and other fuels. Subject: How efficient are your stills? I found your work on "http://running_on_alcohol.tripod.com/" ... nicely done. I have been toying with the idea of alcohol as a fuel source for a while but I live in Seattle, Washington. I don't imagine a solar still would work in the land of overcast skys, and using non-renuable energy to run a still seems silly. It was looking for the answer to this question that I found your site. Can a still be efficient enough to use its alcohol to run it? If so, how much alcohol "profit" is there? Unlike other "free energy" ideas, this one doesn't seem (at least at first glance) to be an obvious violation of physics. I mean, after all, there is a huge nuclear reactor sitting just a quarter of a billion kilometers away pumping new energy into the system. I only used propane to boil my mash when I needed a portable source of fuel for doing energy fairs and such, but mostly I have always used scrap wood --dumpsters and dead fall in the woods. I found that even if my efficiancy wasn't the greatest, I still had something clean and powerful to put in my gas tank. Look at my web page on "Energy: more or less?" When you get into making it commercially efficiency really matters. My very first still, 27 yrs ago, was a solar still, but it only made a pint /day. I have been in the solar industry for 25 years, but if it is fuel for your car, you can't beat ethanol. Look into it a bit more... it is almost a lost art. Because the ethanol fuel-air mixture tends to be poorly vaporized under some conditions, it is useful to use a better ignition system than the conventional breaker points triggering system provided until recently on most cars. Factory electronic or high-energy ignition is satisfactory. But if your car does not come with this type of system, it is worth obtaining an aftermarket capacitive discharge or electronic ignition unit. These can be installed easily, and they increase the voltage at the spark plugs and keep the plugs cleaner. Some difference of opinion exists on the question of spark plug heat range. It is best to start out with the plugs designated for your engine. For hot weather and long distance driving, though, it may be beneficial to use plugs one or two levels colder. If you do, check the plugs to be sure they are not being fouled by oil. Other conditions being equal, the proper timing for an ethanol engine is five to eight degrees advanced from the optimum gasoline setting. But as you make changes described in this chapter, you will change factors that affect the proper timing. Improved manifold heating and increased compression ratio require retarding the timing. So does enriching the fuel-air ratio. With a moderate increase in compression ratio and manifold heating, ignition timing will be more like three to five degrees advanced from the ideal gasoline timing. Gasoline engines without emission controls (through 1967) come with optimum spark timing. 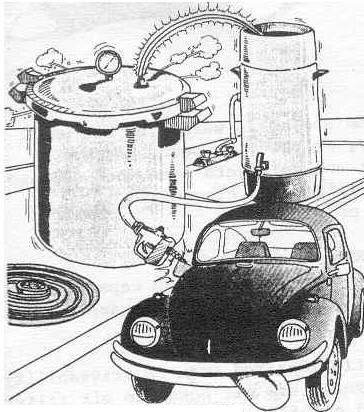 On most 1968-70 cars, timing was retarded to reduce emissions of oxides of nitrogen (NOx). Ethanol combustion produces much less NOx than gasoline, so it is acceptable to advance the timing more on these cars to regain the efficiency and drivability lost to retarded timing. Starting in 1971, automakers used a variety of devices and concepts - some of which include spark-timing controls - to reduce NOx. How you adjust the timing on these cars will depend on the components of your emission control system and is beyond the scope of this book. Ethanol's high octane rating allows a much higher compression ratio (CR) than can be used in a gasoline engine. A typical gas engine these days has a CR of about 8.5 to 1, while a reasonable goal for a converted engine would be 10 or 11 to 1. Increased CR improves engine efficiency. Modified engines in this country have run as high as 14 to 1, but pre-ignition, reduced efficiency, and increased emissions can become problems at such high ratios. There are two usual ways of increasing the compression ratio. Piston replacement. Stock pistons with flat or dished tops can be replaced with domed pistons, which reduce the size of the combustion chamber and thus increase CR. They are often available from racing suppliers. If money allows, this is the preferred alternative. Cylinder head machining. Milling the cylinder head surface also reduces the combustion chamber volume. Possible piston-valve interference and rocker arm geometry problems must be taken into account. On a V-engine, intake manifold alignment with the heads must also be considered. Consult an experienced machinist. In either case, determine engine bore and stroke, and the combustion chamber volume before and after, to calculate the change in compression ratio. To operate properly, an engine must be provided with a fuel-air mixture that is mostly vaporized. A gasoline engine is designed to provide adequate heat to the intake manifold, from exhaust or cool-ant, to vaporize the fuel; ethanol requires about five times as much heat to vaporize the proper fuel-air mixture than gasoline does. The best engine configuration for manifold heating incorporates the intake and exhaust manifolds together on the same side of the cylinder head, allowing heat to flow readily from the exhaust to the intake manifold. Typical of this design is an in-line 6 and, in fact, the Dodge/Plymouth slant-6 has proven to be an excellent engine to modify for alcohol use. On the other hand, in an engine with the intake and exhaust manifolds far apart, fuel vaporization is less satisfactory. Examples of this type are cross-flow head designs (intake and exhaust on opposite sides of the head), air-cooled VW, and V-engines. Unless steps are taken to improve fuel vaporization, performance and fuel economy will suffer, and wear will increase. Several approaches to improving fuel vaporization can be considered. The best one will depend on your specific engine design. Take water from the cooling system and route it through a ¼" copper tube wound tightly around the intake manifold runners. Then provide a return to the cooling system. You must choose the pick-up and return points to provide a pressure differential, so that the water will circulate through the tubing rather than just sitting there. A similar approach can be taken with exhaust gas. Install a pipe fitting in a high pressure area in the exhaust manifold, near the head, and conduct the hot gas through a ½" copper tube to the intake manifold. Braze the tubing to the intake manifold runners, and then connect the tubing into a low-pressure area of the exhaust system, preferably below the muffler. You may wish to pick up exhaust gas at several points with several tubes from the exhaust manifold. Alternatively, route the copper tubes inside the manifold runners. It may be necessary to use tubing smaller than ½". The tubes must run continuously through the manifold so that no coolant or exhaust gas is cycled into the fuel mixture. Drill holes for tubing entrance and exit, and after installing the tubes, braze the holes shut. The advantage of this variant is that heat is available to vaporize the fuel mixture more quickly than if the manifold must be warmed first. The disadvantage is that the tubes reduce the volume of fuel mixture flow to the engine, which reduces power at full throttle. If your car has a water-heated intake manifold, it may be possible to increase the flow of hot water through the manifold heater. This can be done by increasing the size of the water entrance and exit ports, or otherwise modifying the manifold. Also, installing a hotter thermostat will help here. This also improves fuel vaporization within the combustion chamber. Most engines have a heat-riser control valve. You may be able to modify the controls on it to increase manifold heating. Above all, make sure that the valve is working properly. Often it gets rusty and sticks in one position. Many engines have a thermostatic control or flapper valve on the air filter intake, to admit hot air under certain circumstances. You can adjust the control to provide hot air to the carburetor more of the time. Even if you aren't working on a Volkswagen, read the next chapter. The procedures detailed there will help you develop your own modification plan. You will also pick up information - most of it useful - in talking with an automotive machinist or a racing equipment supplier. Then fill in the gaps. Write down the specific changes you will make to the fuel and ignition systems. Devise a plan for cold starting and raising the compression ratio that best suits your engine.